We're going to talk about what I learned from our recent road trip to the left coast. Some of our close friends have a young boy the same age our daughter. 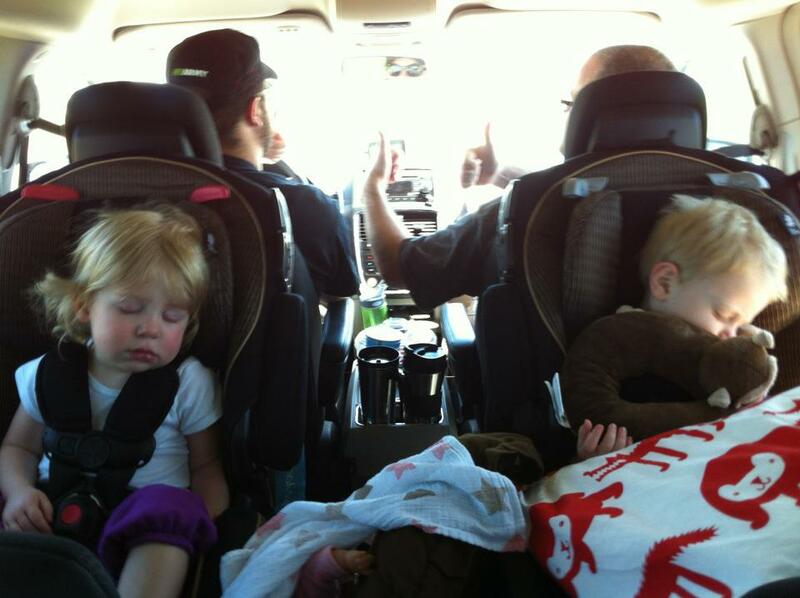 We decided to rent a mini-van and drive 30 hours round trip with two almost two-year-olds in the van. Before leaving I solicited advice from friends and forums alike. Below is some feedback on the advice I received and some advice of my own. After wading through all of the jokes about whiskey, chloroform and Nyquil here are a few of the tips I took to heart. I liked this idea. We'd fill a couple bags with the kids' favorite toys and every time they got bored we'd say something like "I'm sorry you're bored little child. Here is your favorite Muno doll. Please hold him and be silent for the next seven hours." Kid 1 wants kid 2's toys. Kid 2 doesn't want any toys. Kid 1 screams. Kid 2 laughs. Kid 1 continues screaming. Kid 1 throws toy ball at driver's feet where it wedges under the brake pedal. Chaos ensues. Bring Pillows. They'll probably sleep most of the time. Sleep. Sweet, silent sleep. Aren't sleeping kids beautiful? They have cute little snores and sometimes blow little spit bubbles while they dream about how much they love their parents. They slept – one at a time… for about fifteen minutes. The other one, noticing kid 1 was sleeping, took this opportunity to cry some more. This was done with the sole intention of waking up the other child. How do I know this? Because every once in awhile the crying child would pause, check to see if the other had woken up yet, and then continue crying. Once they had accomplished their mission, both children would be awake and crying. Chaos would ensue. This was probably the best idea yet. I can't control the kids, but I can control if I hear them or not. I brought my nice over-ear Skull Candy headphones and prepared for 14 hours of This American Life. If my wife is listening to screaming kids I had better be listening too. My wife is really good at talking with her eyes, and the first time I put them on her eyes very clearly told me "Take those f'ing head phones off and experience this madness with me or I will crawl up there, rip them off of your skull and throw them out the window." The headphones remained off for the rest of the trip. I embraced the chaos. Here are my toddler road trip tips. 1. Plan your lunch stops ahead of time. We spent a lot of time frantically checking our cell phone maps for kid friendly places to eat. A little Googling ahead of your trip will make a big difference when it's time to pull off the freeway. 2. Kids music and sing alongs. You'd be surprised how many times you'll sing "If You're Happy and You Know It…" if it means they will be happy and you will know it. Plus, all of my eye-rolling cynicism about kid's music melted away the second I saw my daughter stop crying and start clapping. 3. Only take the kids out of the car when absolutely necessary. The hardest times were right after we got the kids back in the car. I imagine it was even worse for them. It's like going back to jail. For a two year old four hours in a car is nearly the same percentage of life that four days in prison would be to a 30 y/o. Really. I just spent five minutes doing the math. No, I'm not going to show my work. Prove me wrong in the comments. Bottom line, if you're going to give your kid freedom, be ready for them to scream like hell when you take it away. 4. Pirate Booty. Sanity saver. Chaos Slayer. Seriously. Love the stuff. So did the kids. 5. BE ADAPTABLE. BE ADAPTABLE. BE ADAPTABLE. Your starting points and stopping points may be set, but everything else is up in the air. Like I said before, plan your lunches but don't stress if you need to change them. Stop when you need to stop. Let your sanity be your guide. It really wasn't too bad. For the most part, it was a fun ride and the time we spent on the coast was well worth any trouble on the way up and back. We made it one piece, and only once, just outside Bend, Oregon did I look back and see that not only were the kids weeping, so were the moms… it was Mother's Day. All I could think was "Happy Mother's day ladies. We're going to strap your kids into seats and have them scream at you for a couple hours. Surprise!" There were some nice moments too. On the way home, just after we crossed got into Utah County (about an hour or so outside of Salt Lake) a miracle occurred. Both kids fell asleep at the same time. All four adults made eye contact with each other and smiled. It was peaceful, serene and heartwarming, and all of our eyes communicated the exact same thing to each other: "If you make a single, solitary sound… I will murder you." P.S. One quick notes about products I mentioned in this blog. I was not contacted asked or compensated by either company. Pirate Booty really is awesome. "If my wife is listening to screaming kids I had better be listening too." is literally the funniest thing I have seen all day. Thank you for that. You're 100% bang on the money about 'kid time' being tortuously longer in a car than it really is. The same drive that as a kid, seemed to take a week, I now do regularly, never taking longer than 45 minutes LOL. A little tip from my own childhood, more applicable for the years you're facing than right now, but.. DON'T let your child read in the car. No matter how bookwormy, no matter how blissfully silent it keeps them. Because that blissful silence lasts at most 15-20 minutes before the inevitable pull over for Bookworm to barf routine starts LOL! Why they never took the books off me in the first place, I don't know. I guess the alternative - amusing myself by kicking the back of my mothers seat - was less bearable. But once the reading in the car habit is established, it'll be HELL trying to get that book off them and get them amused by any other non-barf-inducing means.